Primary school teachers really do it all! Although, there can be a few key learning areas that sit a little outside of our personal comfort zone (for me, that would be science and mathematics). However, teaching drama in the primary classroom needn’t be one of them. Fossicking through a list of “40 Drama Activities for Kids” trying to find one that will work in a Drama lesson for your class is surprisingly time-consuming. This post will show you how you can make simple adaptations to already familiar learning activities, in order to explore how voice, facial expression, movement and space can be used to create role and communicate meaning. 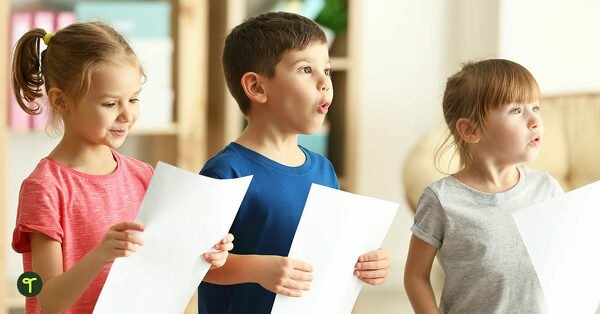 This transferable approach will make planning K-3 Drama lessons easy, by illustrating how you can teach the basic elements of drama in a way that you are comfortable with, using familiar content drawn from almost any key learning area! This twist on the traditional children’s song uses voice, facial expression and movement to communicate emotion. 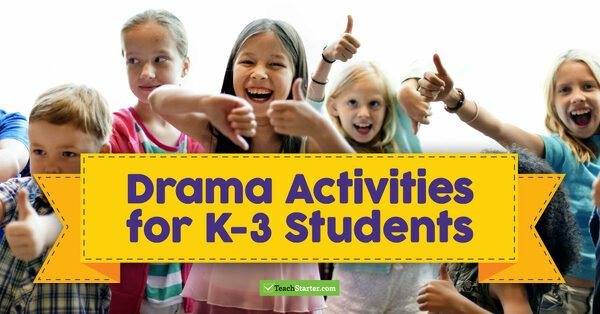 The beauty of this drama activity is the ease with which you can increase or decrease the complexity of the actions and emotions your students enact. If you’re happy and you know it, smile wide. If you’re excited and you know it, jump up high. If you’re tired and you know it, time to yawn. You could use these Recognising Feelings Flashcards as a visual prompt for each instruction. These are great for younger grades and cater to the more visual learners in your class. Check out our Feeling Synonyms Poster Pack and Developing Characters Poster Pack for more “If You’re ‘Something’ and You Know It” ideas! This is a great improvisation game for younger students. You can introduce the concept of using movement to show who or what they are (role) in a fun and easy way. Stand with your students in a big circle and decide which direction the game will travel. Begin the game by inviting them to complete an action, for example, “Let’s wobble like a jellyfish!”. The rest of the circle energetically reply “Yes, let’s!” and all begin to move like a wobbly jellyfish (staying in one spot, of course). Everyone continues the movement until the next person in the circle changes the action by saying “Let’s…” with the new action that they want the class to mimic. The group replies “Yes, let’s!” and change their movement to match the new action. Continue around until everyone has had a turn changing the action. Use this fun classroom drama activity when teaching verbs! Give each student a verb flashcard to use as inspiration for the movement they lead the class in. This activity is so easily adapted to most any theme, context or story you are exploring with your class. For this example, I have selected fairy tales but you can play this game using any relevant theme or narrative! Make a circle of chairs with one less chair than the number of students playing the game. Select three or four fairy tale characters, e.g. Big Bad Wolf, Wizard, Queen. Allocate each student a role by going around the circle, naming each a Big Bad Wolf, a Wizard or a Queen. One student stands in the middle and begins the game by picking out a certain role or characteristic of a role. For example, they may say “Everyone who is a Queen!” or “Everyone who has brown fur!”. All of the students who are playing that role, or have that characteristic, stand up and move to a different empty chair. The key here is for students to move as their character would. This can be lots of fun depending on the theme and the roles that you choose! Whoever doesn’t make it to an empty chair remains in the centre and calls the next character name or characteristic. Students can choose to shout “Fairy Tale Fruit Salad!” and everyone must stand up and find a new chair. 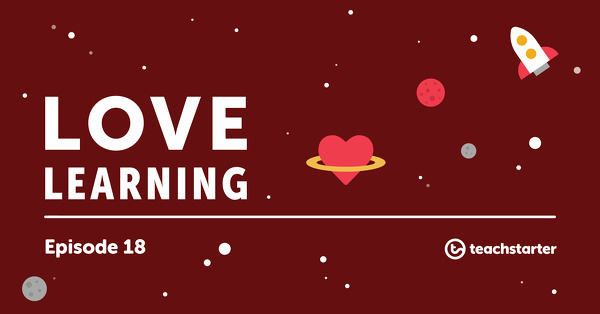 Provide prompts and supports for your students as needed. Older students may easily remember the three or four character names, while younger students may benefit from having the selected characters drawn, written or displayed on posters. You could even create nametags, or find small costume items or props to give each student to help them remember their role. These Fairy Tale Character Posters make a great reference point or prompt for “Make Your Own Fruit Salad”, for fairy tale Readers’ Theatre activities and any other fairy tale related classroom activities! This drama game is a variation of the traditional game ‘Grandma’s Footsteps’ and an excellent introduction to the dramatic elements of role, movement and, for Years 3+, the element of tension. One student, “The Guard”, stands at the far end of the room or outdoor space, with their back to the rest of the class. The Guard holds an object deemed to be “the treasure”. The rest of the class line up in a horizontal line facing the Guard. When the Guard has his or her back to the line, classmates can take sneaky steps towards the Guard. If the Guard turns around, all of the students must freeze in an action pose (e.g. washing hair, climbing a mountain, playing tennis). The Guard can ask three students to unfreeze, bringing their action to life. If the students are unable to show that their chosen pose is a “real” action, they return to the starting line. When someone in the class touches the back of the Guard, they become the new Guard for the next round of the game. “Capture the Treasure” can be adapted to a specific context in order to connect to your current units. Select a “treasure” object that is related to a relevant topic or theme. Identify three or four main roles or characters that can also be connected to the theme. Allocate a character to each student, and when students move towards the Guard, their movements and their frozen action poses must be ones that their character would do. For example, if your unit theme is family, the roles could include a grandparent, a baby and a pet dog! (Remember, your students can use movement to take on the role of most anything – animate or inanimate.) Older students may enjoy trying to embody and come up with frozen action poses for things like a car, a tree or rain! Have a go at presenting your class with a context and characters for this game. You may be surprised by just how creative and spontaneous your younger students may be! You can use this classic game to teach students about the dramatic element of movement. The basic concept of ‘Follow the Leader’ can work beautifully by adding a contextual twist. Students stand in a single line with a designated leader (you may like to have two shorter lines if you are comfortable to set boundaries for and manage both groups). The leader decides where the line will go, and how it will move. All of the students in the line follow the leader, copying their actions. You can add in a suitable layer of context from any unit you are doing with your class. This turns “Follow the Leader” from a simple physical game into a “Follow the Story” drama learning experience that explores improvisation, voice, movement, space and even the creation of tension, situation and role. Begin by using these great movement word wall cards to explore all the different ways students can move their bodies. Ask students to come up with a situation that will become the imaginary world that their line is exploring or travelling through. Establish this by choosing a place, describing what it looks like and what features it may have (water, mountains, trees, sand, a building with small or large rooms etc.). The more detail you come up with before the game, the better! Students can select a character or role that the leader (and subsequently the entire line) can take on when moving through this imaginary place. Movements and actions should then reflect the character, and the type of environment the character is in. This physical drama game is great for showing students how a large group can together use their bodies to create a single character (in this case, the character is a snake!). While it can be a little tricky to explain, once students know and understand how to play this game, it is always a favourite! Split students into two even groups, standing in two parallel lines (A & B). Have the groups face towards the centre of the space and, similar to the classic game of “Cat and Mouse”, students hold hands with the people on either side of them in order to form the ‘snake’ (the students on the ends of each line will have one hand free). Starting at the same end of each line, give each student a number, counting up from one. Student number one in line A should be standing opposite student number one in line B. Call out two consecutive numbers, e.g. “Five and six!”, and the students who are those numbers lift the arms that connect them. At this point, the students on each end of the lines have to lead the snake through the raised arms without letting go of hands. With hands held, the body of the ‘snake’ twists through itself and the first group to straighten back out into a line is the winner! Increase the complexity and add curriculum connections by modifying the calls and actions. You can make the actions specific to a situation or to characters from a familiar narrative. You may even like create actions that connect with key terms from a mathematics or science unit. There is really no limit to how you can adapt the Traffic Lights drama game! “What Are You Doing” is another excellent improvisation activity for primary school students (Hello again, verbs! ), and one that is a slightly more challenging game than “Yes, Let’s!”. Building the confidence of students to speak aloud can be supported through whole group improvisation activities like this. Students practise projecting their voice and using movement to communicate meaning in this fun mime activity. Stand in a circle and establish who will start the game. Tell students which direction the game will travel (clockwise or anti-clockwise). The first student begins by mimicking a simple, repetitive action (e.g brushing their teeth). The second student asks “What are you doing?”, to which the first student answers by saying something completely different to the action they are doing (e.g. while brushing their teeth the student may say “I’m swimming!”). The second student then begins to mime the new action (e.g. swimming). Continue the game around the full circle. Add a familiar context from any key learning area in order to turn this game into a drama lesson activity. Again, you can layer in context by asking students to take on a role from a story, a poem or most any context you are exploring in your current units. The actions they initiate should then reflect a part of the story. In doing this, your students will be using voice and movement to create a role and to communicate meaning about a situation, all of which are fundamental elements of drama. At the risk of sounding reminiscent of Mr G from Summer Heights High, the elements of drama can be explored through almost any subject matter! Drama is, essentially, the study of how people understand, relate to and communicate ideas about an idea or an aspect of a world (animate or inanimate, real or imagined). For this reason, it really is one learning area with key concepts that can be explored using context from a seemingly “unrelated” learning area. Now I’m thinking just how much fun a “Move Like a Minibeast” brain break would be at the end of a science lesson! Hopefully, this post has illustrated how easy it can be to take a familiar children’s or classroom game and create an adaptation that provides both you and your students with means to explore the elements of drama! Do you know a teacher who might enjoy this approach to teaching K-3 Drama? Use the buttons under the title of this post to share it with them via email or on Facebook! You may also like to check out more Drama games and activities listed in our blog post “Drama Games for Kids: Years 4-7”. Here you’ll find the most comprehensive resource of drama games for kids and teaching drama tips. Drama games are an important part of any drama curriculum because they can teach valuable theatre skills while allowing students to have fun, build confidence, stretch their imagination and grow as an ensemble. Our goal is to provide you with the very best activities that will help make your drama club spark to life. Check back often as we’ll be updating every week. Enjoy! Looking for a musical for young actors? Our award-winning plays for kids are guaranteed to be a hit. And best of all, production materials are delivered within 24 hours! Click here to learn more. Looking for a children’s musical for your upcoming camp or school year? Check out our selection of award-winning, high-quality plays for kids to perform. We’re dedicated to helping you with everything drama-related. If you have a comment or a question, leave it below or send us an email and we’ll respond the best we can!